Boasting a catalog comprised of comedic plays, tragedies, and seemingly unending works of poetry, William Shakespeare was versatility personified. Whether he was crafting unforgettable soliloquies, displaying the self-discipline required to write entire works only in iambic pentameter, or having the foresight to marry Anne Hathaway nearly 425 years before she became a famous Hollywood actress, The Bard of Avon, as he was known, still inspires scholars and audiences alike to this day. So it is only fitting, then, that a golf disc bearing the same name would also have such wide-ranging appeal. The Westside Discs Bard is the Finnish manufacturer’s first foray into the land of overstable midranges. And while I didn’t find it as beefy as its printed flight numbers suggest, it certainly complements the rest of its lineup very well, proving that it is more than a one-trick overstable pony. Out of the box, the first thing I noticed about the 172-gram Tournament Plastic Bard I was sent by Dynamic Discs (Westside’s stateside distributor) was the juxtaposition of a prominent bead on the bottom of the wing with a flat – borderline concave, actually – flight plate. It gives the disc a nice balance, providing a sleek, modern feel in the hand due to not having much dome, while also giving the classic security of a bead. The flat top also seems to cut down on the amount of glide the disc has, while helping it retain speed (which the bead naturally works to diminish). This combination results in a balance of velocity and control that is both exciting and comforting. This current run of Tournament Plastic – which is the same blend as Dynamic’s Fuzion plastic and Latitude 64’s Gold Line – is more pliable than past iterations I have experienced. As a result, I was able to get a good pinch into the flight plate when power gripping it, which was especially useful on the cooler days that I saw during initial testing. Even after the weather warmed, though, the integrity of the plastic remained and it didn’t get overly floppy. Westside’s initial release information for the Bard made the bold claim that it “may be the most overstable midrange disc of all (of the) Trilogy family within speed classes 5-6.” The manufacturer effectively doubled down by handing it turn and fade numbers of 0 and 3, respectively, putting it in the realm of the Dynamic Discs Verdict (0 turn/3.5 fade) and Innova’s Roc3 (0 turn/3 fade). Naturally, then, I wanted to put this claim to the test by comparing the Bard to other discs in its family. While I don’t have a Roc3, I certainly have plenty of other Trilogy molds getting in my wife’s way around the house, so I took the Bard out alongside the aforementioned Verdict, as well as a Westside Harp (overstable putter) and Dynamic Discs Suspect (overstable putter/midrange tweener). These aren’t all in the same distance range, but I thought it would present a nice progression of overstability as one ticks up in speed throughout the Trilogy lineup. As a result, I would disagree with the Bard’s published 0 turn and 3 fade numbers, and likely assign them something more in the range of -0.5 for turn and 2 for fade. And this is not a problem at all. One quibble I have with both the Harp and Suspect is that, for molds that are generally overstable in nature, they tend to straighten out a bit more than I like when powered up. That is, they display excellent stability in the high speed portion of the flight, but then fade less on longer shots that take more heat. It’s something I’ve adjusted to, but sometimes you want to be able to put all the mustard you can onto a throw and still have it fade. That’s what I was looking to do with the Bard. Compared to the Harp and Suspect, the Bard has noticeably more fade at the end of its flight on a full-power throw. Even into a headwind, its line remained true and it still faded reliably, whereas the Harp and Suspect both tend to travel on the straight line on which they were released. How about compared to the Verdict? For my arm speed, the Verdict offers both more high speed stability and low speed stability than the Bard. On a harsh anhyzer angle, I find it much more difficult to coax any turn out of the Verdict, whereas the Bard can turn for a good 70 percent of its flight before fading out at the end. As a result, I would disagree with the Bard’s published 0 turn and 3 fade numbers, and likely assign them something more in the range of -0.5 for turn and 2 for fade. The pleasant surprise about the Bard being a touch less overstable than its printed numbers is that it has surprising upside as a workhorse midrange. Truth be told, I wasn’t terribly looking forward to this release when Dynamic Discs agreed to send it to me. Yes, I was certainly grateful that they were taking a chance on sending review products to a new site, but I was nervous that I would find the disc to be such an unusable meathook that I would be left with nothing to write about it. With some canopy overhead, the safe line on Hole 8 at Kit Carson Park is the straight-to-fade route. The Bard has it covered. Instead, I have found a mold that, similar to its Trilogy cousin the Dynamic Discs Truth, can compete for solo midrange duties in any bag. 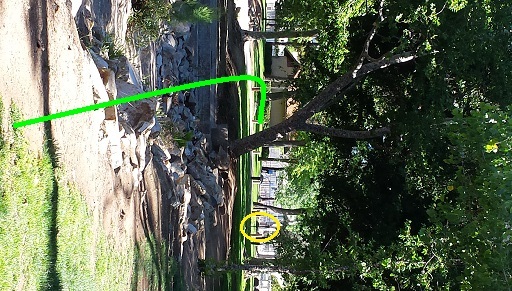 Case in point: Hole 8 at Kit Carson Park. Though it’s a mere 234 feet off the tee, I prefer a midrange drive here due to some canopy that isn’t conducive to noodle arm putter throws. There are a couple lines to choose from, but the safe route calls for a long, straight shot with a dumping fade at the end to park you for a birdie. The Bard was made for this shot, and the extra 15-20 feet of lateral play you get out of it versus the Truth makes it extremely useful. And while the Bard excels at the straight-to-fade lines that most midranges of this class do, I actually really enjoy putting the it on a slight anhyzer to make for some tasty flex lines. Keep it low and it’ll hold that anhyzer line longer, or give it some height and it will stall out and fade a bit earlier. Pick your poison. In fact, the only real weakness I have found with the Bard is the hyzer line, and that may have more to do with me than the disc. I have found that when I don’t dial in the correct amount of hyzer and give it too deep of an angle, it will simply fall out of the sky much earlier than I anticipate. However, that same hyzer can be useful, as it holds well in a headwind. It’s a tradeoff I can live with. In fact, I can live with the vast majority of my experience with the Bard. It rounds out the Westside midrange lineup quite well, providing more predictable results than the stable Westside Warship, a disc that is longer off the tee but more prone to drifting off its line or getting knocked around in the wind. If a shot calls for the disc to fade, but to still have some ease of workability to it, the Bard can handle it. Sometimes you have certain expectations for a disc, and sometimes those expectations aren’t met. With the Bard, that proved to be a positive. Now please excuse me while I go pen a soliloquy in its honor.